Only a few weeks after the 4th anniversary of the lethal attack against Czech troops in Afghanistan, during which five servicemen have been killed by a suicide bomber in Qalandar Khil, another suicide bomber killed three Czech soldiers in Charikar. In total 27 were killed since 1991, during the operation Desert Storm in Iraq, during the UN multinational missions in former Yugoslavia and later in foreign operations under the flag of the Alliance, in Kosovo, Iraq. And 13 were killed in Afghanistan since 2007, during the International Security Assistance Force (ISAF) and now the Resolute Support missions. 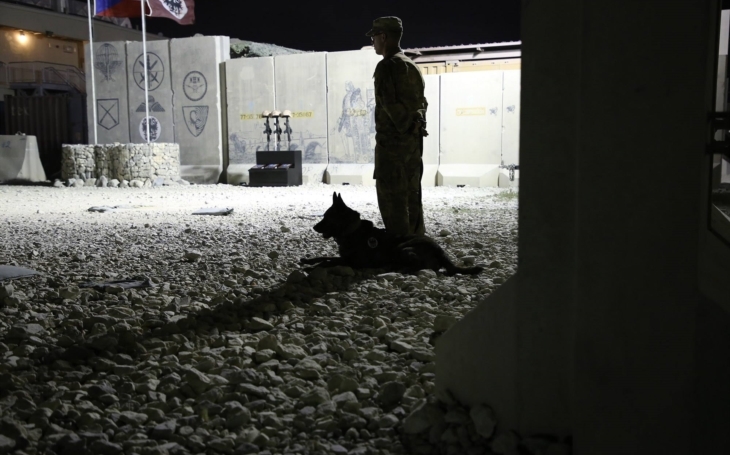 A detachment of the 10th ACR Guard Company BAF (Bagram Air Field) was conducting a joint foot patrol with U.S. and local Afghan soldiers around the Bagram Base, Parwan Province, which is the largest U.S. military base in Afghanistan, about 40 km north from Kabul. The former Soviet base is vital for the large scale operations as it is the only Afghan all-weather airfield, secured during the 2001 invasion. The Czech Army deploys Guard Companies to the Bagram Base since October 2013. Their mission is to to deflect hostile activities against the base. Staff sergeant (OR-4) Martin Marcin (born 1982), corporal (OR-2) Kamil Beneš (born 1990) and corporal (OR-2) Patrik Štěpánek (born 1993), all from the 42nd Mechanized Battalion of the 4th Rapid Deployment Brigade, were killed during the patrol by a suicide bombing claimed by the Taliban. The attack was carried out by a lone bomber at 6 a.m. in the city of Charikar, wounding also one of the U.S. and two Afghan soldiers. Staff sergeant Marcin served in the Czech Army since 2003 and the current operation was his fifth foreign deployment (he served twice in Kosovo and three times in Afghanistan). He leaves behind a widow and a three-month-old baby. Kamil Beneš and Patrik Štěpánek served since almost five years. "The soldiers were experienced, they were on this mission since several months. The tasks they carried out were not new for them, they did not operate in unknown terrain. Sometimes there are situations which do not allow for any reaction," Major General Jiří Verner, Director of the Czech Army’s Joint Operations Centre said. "I would like to stress, as have all representatives of the army and state who have had a chance to officially express their condolences, that for us these soldiers are heroes. They were fighting against terrorism, many thousands of kilometres away from their families. And we consider this fight to be crucial, absolutely essential." "My thoughts and prayers, along with those of all of the 41-contributing Resolute Support nations, are with the families and friends of our fallen and wounded service members, and our injured Afghan brothers and their families. Their sacrifice will endure in both our hearts and history, and further strengthen our resolve," U.S. Army General John Nicholson, commander of the U.S. and NATO forces in Afghanistan said. The Czech politicians, includng the President Miloš Zeman, Prime Minister Andrej Babiš, Minister of Defence Lubomír Metnar or Jana Černochová, chairwoman of the Committee on Defence, offered their condolences to the grieving families. Bodies of three fallen heroes will be transported back home on Wednesday. 230 Czech soldiers are deployed in Afghanistan as part of NATO's 16,000-strong Resolute Support mission, which remains in the country for training and counter-terrorism operations after the Alliance ended its combat mission in 2014. In June the Chamber of Deputies approved a plan to deploy additional 160 soldiers to the Resolution Support mission during the following two years. "Despite the tragic events, I am convinced, as is the entire leadership of Czech Army, that we are doing the right thing, in the right place. And this will definitely not deter us from carrying out our actions, as specified in our mandate for 2019 and 2020. I don’t anticipate any re-evaluation of the mission in this respect," general Verner said. Several political parties, including the communists (KSČM), as expected, use the tragedy to promote their anti-NATO and anti-U.S. political stance. According to the Communist party the Czech Army should quit missions which lack the U.N. Security Council's backing. They somehow forget that on 12th December 2014 the U.N. Security Council welcomed the agreement between the NATO and the Afghan Government to establish a non-combat, training, advisory and assistance mission: the Resolute Support mission. The resolution was adopted unanimously. See also: New Czech Government: do we strenghten the Czech foreign deployments? Nearly 3,500 allied servicemen were killed in Afghanistan so far; 2,313 of them were U.S. soldiers. Despite the allied military presence dropped considerably in 2014, both the Taliban and a local Islamic State affiliate regularly target Afghan and allied security forces, and civilians. On Friday two suicide bombers dressed as women in burquas struck a Shiite mosque in Gardez with explosives and gunfire. Thirty-five were killed and more than 90 wounded. The worst attack against the Czech troops occured on 14th July 2014. Staff sergeant (OR-5) David Beneš (born 1986), sergeant (OR-3) Ivo Klusák (born 1980), corporal (OR-2) Libor Ligač (born 1981) and corporal Jan Šenkýř (born 1975) were killed by a suicide bomber in Qalandar Khil village, Parwan Province. The blast killed two Afghan policemen and 10 civilians, and wounded Staff Sergeant (OR-4) Jaroslav Lieskovan, who died from his injuries six days later in the Central Military Hospital in Prague. Staff Sergeant (OR-6) Nikolaj Martynov (born 1979) died on 4th May 2007 in the Central Military Hospital in Prague of injuries sustained when an avalanche struck his vehcicle convoy southeast of Fayzabad in Badakhshan province. Warrant Officer (OR-7) Milan Štěrba (born 1972) was killed along with two Danish soldiers, an interpreter and three Afghan civilians when a suicide bomber rammed his vehicle into a military convoy in Gereshk in Helmand province on 17th March 2008. Staff sergeant (OR-4) Radim Vaculík (born 1979) died after an improvised explosive device burst up under the HMMWV vehicle used by the Czech contingent serving at the Provincial Reconstruction Team in Logar on 30th April 2008. Four other Czech soldiers were injured, one of them seriously. Staff Sergeant (OR-4) Robert Vyroubal (born 1980) was killed (two other soldiers were wounded and an Afghan interpreter killed) on 31st May 2011 when a roadside bomb detonated against their patrol vehicle near the village of Salar in Wardak province. Staff Sergeant (OR-4) Adrian Werner (born 1979) died on 9th October 2011 in the Military Hospital in Olomouc from a bullet wound he received when enemy forces attacked a Czech military base in Wardak province on 6th July. Four soldiers died during the SFOR missions in Bosnia and Herzegovina. Major (OF-3) Jaromír Nasavrcký (born 1961), Captain (OF-2) Rostislav Samec (born 1961) and Captain (OF-2) Bohumil Vávrů (born 1953) were killed on 25th October 1998 near Tomislavgrad, in a fatal helicopter accident. Warrant Officer (OR-7) Ivan Zapadlo (born 1978) died from injuries sustained during a de-mining exercise with real ammunition on 13th July 2001 in a military hospital in Šipovo. Five Czech servicemen died during the UNPROFOR and UNCRO missions in Croatia. Corporal (OR-2) Václav Martínek (born 1952) died at a road accident near Ubdina on 13th January 1994. Sergeant (OR-3) Petr Hos (born 1970) died at a road accident of the OT-64 Armoured Personnel Carrier in Ljubovo region on 21st March 1995. Captain (OF-2) Jozef Palov (born 1961) was shot by Warrant Officer (OR-7) Jiří Máca after a quarrel on 25th March 1995. Staff Sergeant (OR-4) Luděk Zeman (born 1958) and Sergeant (OR-3) Petr Valeš (born 1973) died from fatal injuries by mortar shells on 4th August 1995, in the U.N. observation post Tango 23, in Ljubovo region. Three Czech soldiers died in Kosovo. Warrant Officer (OR-6) Vlastislav Hendrich (born 1978) and Staff Sergeant (OR-5) Luděk Severa (born 1977), members of the 1st Czechoslovak Battalion, were killed at a road accident of the OT-64 Armoured Personnel Carrier near Šajkovac on 14th September 2002. Warrant Officer (OR-7) Lubomír Bejdák (born 1972), military policeman, commited sucide at the base in Šajkovac village on 30th July 2006. And Warrant Officer (OR-6) Pavel Mauer (born 1978) died on 2nd May 2003 in the Central Military Hospital in Prague from injuries suffered during a road accident near Ali al-Gharbi in Iraq, Operation Enduring Freedom. The very first loss of the Czech (Czechoslovak) Army after the Velvet Revolution in 1989 was sergeant Petr Šimonka (born 1970), member of the Czechoslovak Chemical Unit, who was killed on 18th January 1991, during the opening phase of the Desert Storm operation. Political debates over the aims and results of the different missions are possible, even necessary. Yet they have no meaning now, nor can anything remove the merits and downgrade the ultimate sacrifice by the fallen servicemen. Several charity projects support the families of fallen soldiers, and generally the veterans, including the REGI Base I. foundation. "The purpose of establishment of the Foundation REGI Base I. is the development of spiritual values, support for reintegration into the civilian community, assistance with rehabilitation, retraining, job placement, provision of material support and funding for present-day war veterans." The foundation is named after lieutenant Jiří Schams, nicknamed "Regi", which is an anagram of "GI Ranger" as Regi was known for his enthusiasm for the U.S. elite troops. Veteran of many foreign missions including Kosovo, Iraq and Afghanistan with the SOG (Special Operations Group). He was severely wounded by a suicide bomber in March 2008. He was disabled, but survived, and for the rest of his life he supported the war veterans and their families, until he died from cancer in 2015.